And my teeth were clattering together. THE LOGOS. Did the logos get done in time? Does everyone have them? It’s funny that my first thoughts out of surgery were about work. I suppose I shouldn’t have worked the entire morning and drive to the hospital. I was so worried about falling behind (story of my life). This is the Leslie Knope in me. “Ashley, are you OK, honey? ?” The nurse asked me. I wanted to open my eyes, but I couldn’t. I wanted to say something, but I found no words. I kept fighting to open my eyes. I knew I had surgery. I knew I was in Indianapolis. And I knew the guy next to me wouldn’t stop shouting about how his crazy girlfriend shot him. Side note: he sounded like the crazy one. I finally got my eyes to open- but only for a second. I saw the clock: 4:15 pm. The last time I looked at the clock it was 2:00 pm. I remember walking down the hall to the operating room. I realized I was doing my nervous storytelling. But I didn’t share all the details from the night before. The enema story is something I will never forget. I can honestly say I’ve never – in my entire life- seen Justin laugh so hard. He came home that day at his lunch break. He bought me a heart shaped pizza, beautiful flowers, a side of guacamole (I believe it has magical healing powers for my ovaries), and the enema. 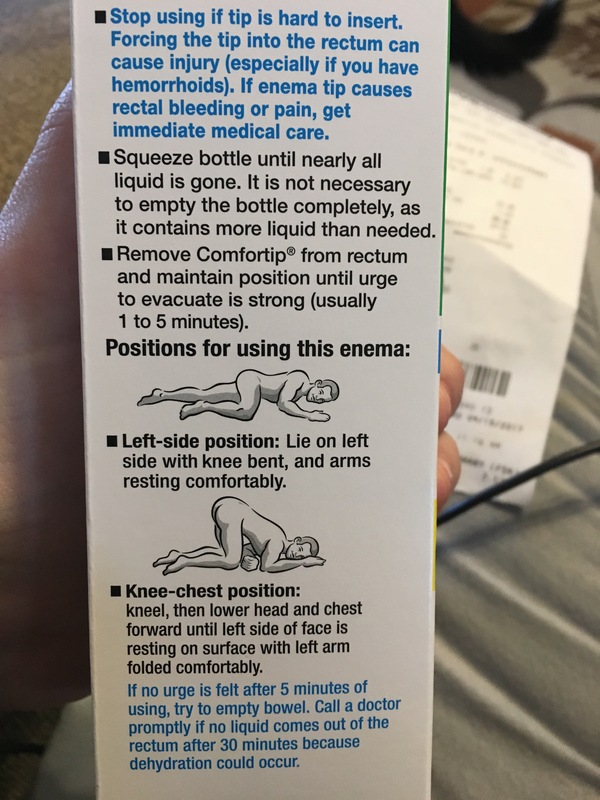 So, if you’re like me- you have no clue what an emema is…basically, it’s a squirt bottle that you use to cleanse out your bowels. “So, which position do you want tonight?” Justin asked. “I personally think you should do the bottom one,” Justin said. He rennacted the scene and I nearly peed my pants. I held it together for 00:01:47 before I jumped on the toilet and re-created the scene from Dumb & Dumber. “What is happening to me, babe? ?” I asked. Justin was laughing so hard that he couldn’t breathe. Tears were streaming down his face. And he collapsed on the ground. At that moment, I realized I married a wonderful man. Someone who could see me at my absolute worst- and still think I am the best person to ever live. What a romantic Valentine’s Day…. Once I went to the bathroom, we finally got to the OR. The room was bright. And mostly white. It was freezing cold. I started to get nervous. Everyone was fully covered in OR gear and masks. I saw the instruments they were going to use to cut into my stomach. I started to feel light headed. I climbed on the bed. There were spots to spread my arms out. They started to strap down my legs. They put a blanket on me, which felt nice. “Scoot back a bit more for me, Ashley,” the anesthesiologist said. My arms and legs were trapped. And my body was weak from being so hungry and thirsty. I tried to move and part of me felt like it was a joke or a test. I was talking to one nurse about the Rain Ride- a bike ride across the state of Indiana! He her husband does it every year. I told her I hoped to do the ride in the next year or two. It’s 156 miles. “I’m going to give you a little medicine to calm your nerves,” the doctor. The guy to my right was still rambling about his girlfriend who shot him. So dramatic, I thought. I wished my eyes could open so I could see him. I heard the nurse talking about my medicine and the last time she gave me something for pain. I started to open my eyes some more. “I’m a 3,” I said. They placed a warm blanket on me and my eyes started to open better. I drank some water. My trembling body calmed down. The best graham crackers EVER! They wheeled me to the waiting room, and my family came in about 5 minutes later. I remember seeing my dad first. Wait. Maybe Justin came in first? I can’t remember! “I feel great, I think,” I said. “That’s the drugs,” he laughed. “I like them,” I said. “Well, let’s hope that’s not what is happening,” I said. My mom came in the room after my dad left. I tried to get out of bed about 20 minutes once I got back from recovery. I even walked to the bathroom on my own about 45 minutes later. I was very motivated to leave and eat food!! I debated on showing the pictures or not. I’m not big on looking at pictures like this myself. But, I am on a mission to spread awareness about PCOS. And I believe a picture is worth a thousand words. I need people to understand how bad PCOS is to a woman’s body. Once you see these pictures, you’ll understand the pain I lived with every single day. Those massive ovaries and cysts controlled my whole world. They controlled my body. What I ate. Where I went. How I moved. They controlled my mind. My anxiety. My depression. So, here are the pictures…keep scrolling if this isn’t your cup of tea. The black dots that you see are the cysts and eggs that never dropped. Here is one of my ovaries after the decompression. Basically, he drilled holes in my ovaries for the cyst to drain. He got about 20 of the cysts. This drawing shows you how large the ovaries should typically be (see top right). The extra drawing and cysts shows you the size of my cysts. The drawing on the left shows the Fallopian tube and where those cysts were located. When I look at these pictures, I feel like super woman. I had golf balls – filled with these painful cysts – trapped inside my body. They weighed me down every single day. I fought hard for every workout on this weight loss journey. Heck, most days it was hard to simply pull myself out of bed. The odds were against me in every way possible. But I managed to lose the weight. Ask for help. Continue to stay positive. As of this morning, I am down to 187 lbs (down 104 lbs). I’ve lost nearly 36% of my body weight! My next secret goal is 175. I guess it’s not a secret anymore! I am not living by a number on the scale, though. I will be happy feeling healthy and looking strong! I’m not sure if the cysts will return. The hope is they don’t. Dr. Mac said I’ll feel my best in about 3 months- right in the middle of my Iron Man training. I feel so crazy for signing up for this Iron Man. But after everything I’ve been through, I know I am strong. I know I am capable of anything. I know that I am just getting started on that new journey. After my surgery, I ate chicken noodle soup, waffle fries, and a fried chicken sandwich. I felt full, and happy. On the drive home, I felt hopeful and relieved. I couldn’t believe how great my body felt. Of course, I had pain from the incisions. And the gas they used to fill up my body made it nearly impossible to get comfortable. I think the pressure and discomfort from the gas was actually the worst part of recovery. In fact, I probably only slept for 4 hours the first day home. I spent the first few days at home laying on my couch. I binge watched Netflix shows and found myself on the edge of tears. I had so many people messaging me and checking in on me. It meant the WORLD to me. 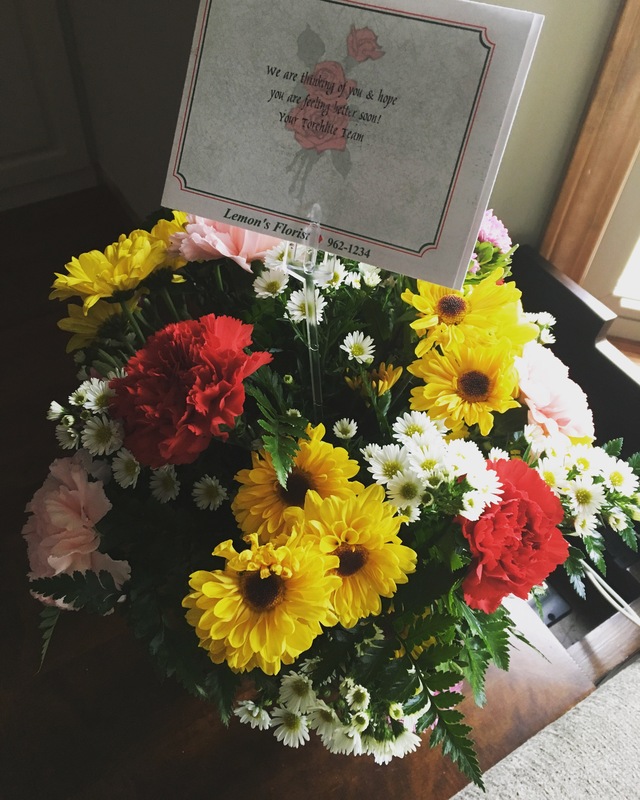 My Torchlite family had flowers sent to the house, and that brightened my day beyond words. 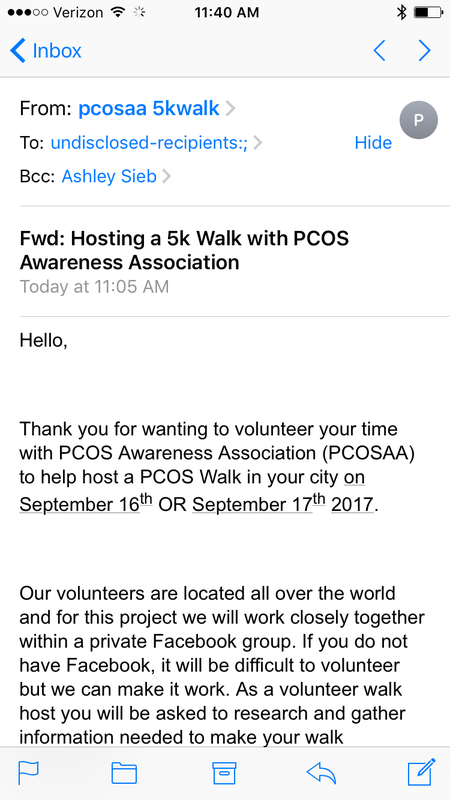 I signed up to host a PCOS volunteer walk in September. I hope you’ll join me. This is extremely important to me. 1 in 10 women suffer from PCOS – many of them go undiagnosed. If they are diagnosed, it’s often difficult to find a doctor who listens and understands what PCOS does to your body. 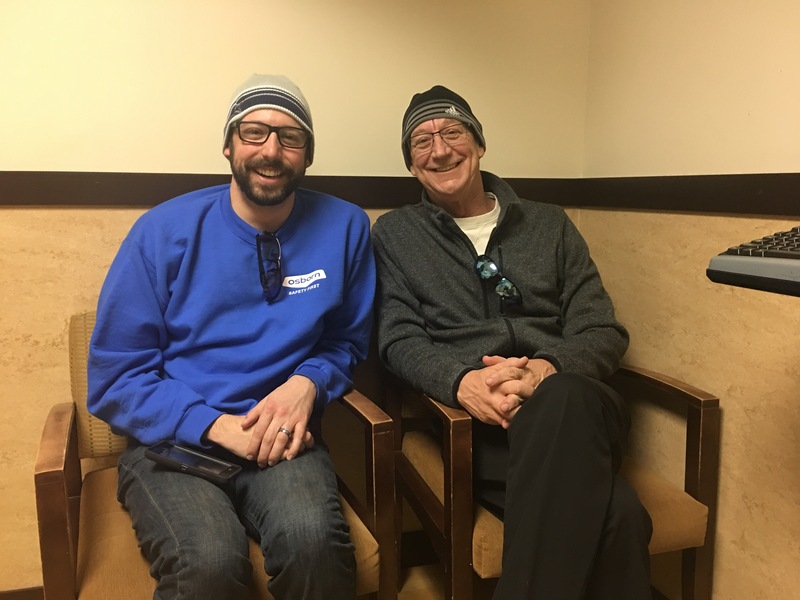 I went to 6 doctors searching for answers and relief. Dr. Mac was the first and only doctor to listen. Equally important, he educates me my body and what is happening because of PCOS. Today, marks day 3 post-surgery. I started my period- which feels like a cruel joke. I am emotional. I actually cried myself to sleep last night. My anxiety is slowly returning. I am starting to feel behind at work. The real world is starting to creep back in. I can’t lay on the couch everyday, watch Gilmore Girls, and eat cold pizza. But, the pain is gone. The original pain that led me to this surgery is 100% gone. It’s almost unreal. Now, I have to address and deal with the emotions of healing and moving on. I said farewell to those cysts, but I will always have PCOS. It’s a condition that will never go away. I will have it for the rest of my life. So, this is more of a farewell story to the pain and hurt of my past. It’s about closing a chapter, picking up my pen, and writing a new story on a blank sheet of paper with only a date at the top of the page. No, I am positive that I can handle what life throws at me next.